Until recently, the taxonomic Kingdom level was the broadest grouping of organisms, of which there were 5 generally recognized. 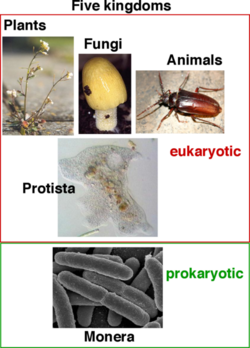 For many textbooks, these 5 will still be recognized (Animalia, Plantae, Fungi, Protista, and Monera). More recently, the Kingdom Monera was divided into Eubacteria and Archaea (formerly known as Archaebacteria) rendering six kingdoms. Subsequently, Archaea and Eubactera (now Bacteria) were elevated along with Eukaryota to the level of Domains. Therefore, the Domain is now the highest taxonomic level. In the following table, the 6 Kingdom system is displayed, although individual pages will identify the latter two as domains. All of the organisms in a particular kingdom share the same features. Within each kindgom, there are usually several phyla that are each distinct from the other phyla in that kindgom. This page was last modified on 16 August 2013, at 22:30.